Chautauqua Returns to Oregon for the 2017 Tour! In July 2017, Chautauqua will be revisiting some of the small towns in which we built connections during our 2012 Eastern Oregon Tour. We will be teaming up with local community organizers to bring laughter, light and education to prisons, reading programs, and assisted living homes, as well as the general public. 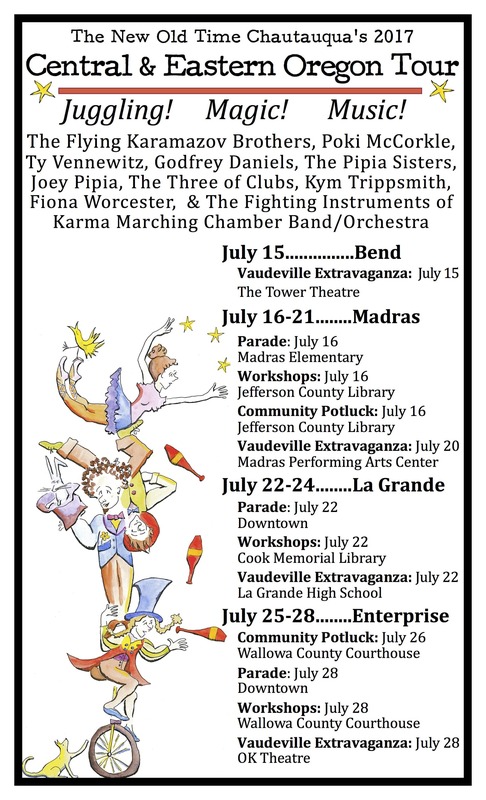 We will be presenting a program of free potlucks, parades, and workshops, as well as a Big Vaudeville show in each town. We will kick off our tour on July 13th with a show and workshops at Oak Creek Youth Correctional facility in Albany. On Saturday July 15th, you can catch us parading through downtown and local farmers markets in the afternoon, and will present our big show at 7:00pm at the Tower Theatre. Tickets are available at www.towertheatre.org. Chautauqua will lead a celebratory parade through Madras at 1:00 pm on July 16. All community members are welcome to join! This will be followed by free public workshops at the Jefferson County Library from 1:30-4:30pm and a community potluck at 5:00 pm at the Library. All community members are invited to bring a dish and mingle with their new Chautauquan friends! Our week in Madras culminates in a knock-yer-socks off vaudeville show at 7:00 pm on July 20 at the Madras Performing Arts Center. This performance is free of charge thanks to generous grants from the Bean Foundation and the Jefferson County Cultural Coalition. 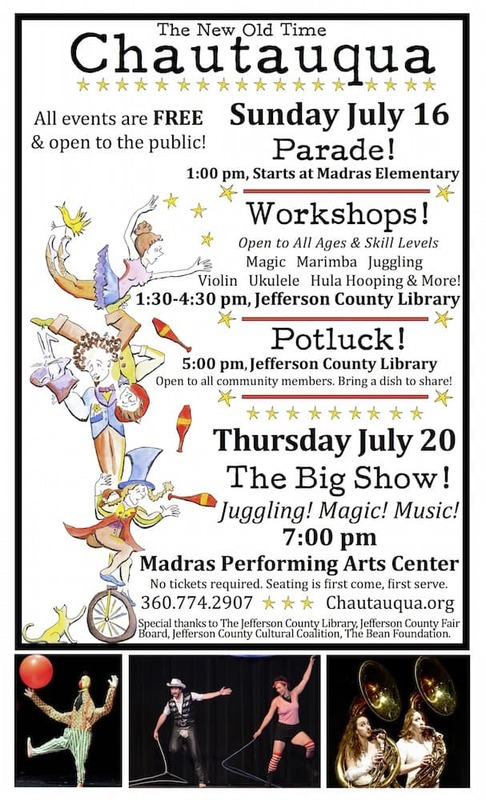 In addition to these public events, Chautauqua will offer events throughout Jefferson County during the week including outreach performances at The Kids Club’s, Deer Ridge Correctional Facility, Warm Springs Boys & Girls Club, and the Oregon Child Development Coalition. Chautauqua rolls into La Grande for full day of events on July 22nd. The day starts with a downtown parade at 11:30 am, free public workshops will follow at the Cook Memorial Library from 12:00-2:00 pm. The day wraps up with our Big Show at the La Grande High School Auditorium at 7:00 pm. Tickets are available at the door. Our final stop is Enterprise, we'll start our visit with a community potluck in the Gazebo in front of the Wallowa County Courthouse. Bring a dish to share and get to know our group of performers and educators! A celebratory parade downtown starts the day on Friday, July 28, followed by workshops from 12:30 to 2:30 on the lawn in front of the Wallowa County Courthouse. In the evening, Chautauqua returns to the OK Theatre for a rollicking night of juggling, music, and vaudeville at 7:00pm. Tickets are available at The Bookloft. We'll wrap up our tour with on Saturday July 29th, with a performance and workshops at the Eastern Oregon Correctional Institution in Pendleton. Our previous visits in the summers of 2016 and 2012 brought joy to performers and audience alike. Circus, music, and comedy fill the Tower Theater on Saturday, July 15. 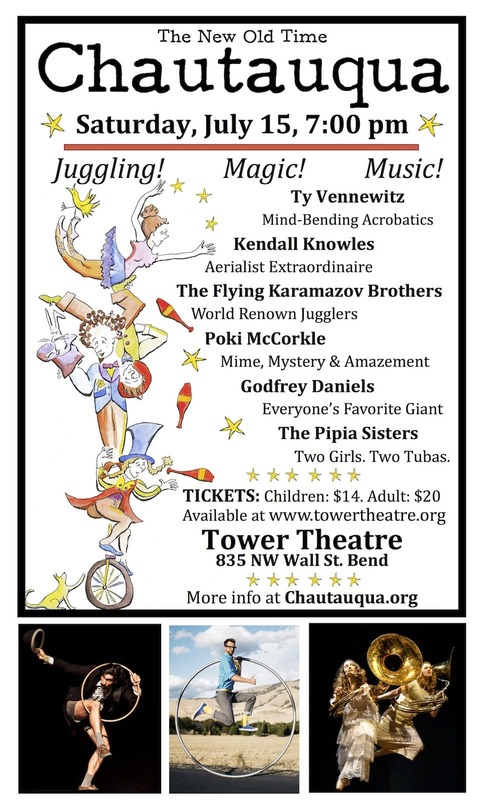 The New Old Time Chautauqua, a nonprofit arts organization, is returning to Bend July 15th for one night only bringing a live vaudeville show featuring circus arts, music, and magic. The show features show-stopping acts by world renowned juggling group, The Flying Karamazov Brothers; Ty Vennewitz, cyr wheel and hula hoop artist; Poki McCorkle, award winning mime and juggler; The Pipia Sisters, real life sister duo on dueling sousaphones; special guest, Kendall Knowles, Bend’s own aerialist extraordinaire. Throughout the show, enjoy the rousing live music and zany wisecracks by the Fighting Instruments of Karma Marching Chamber Band/Orchestra, playing music ranging from marches and sambas to New Orleans Jazz. The New Old Time Chautauqua is a non-profit organization dedicated to bringing laughter and inspiration to communities that need it most. Following Chautauqua’s stop in the Bend, the troupe of 50 volunteer performers and educators will travel north to offer free performances and arts education in Madras and on the Warm Springs reservation, in addition to outreach performances at the Deer Ridge Correctional Facility, and the Eastern Oregon Correctional Institute. The organization was founded in 1981 by the Flying Karamazov Brothers, Patch Adams, and Faith Petric. Inspired by the traveling Chautauquas of the early 20th century, Chautauqua aims to be a catalyst for strengthening communities and elevating lives through laughter, inspiration, and learning. For the past 36 years, the dedicated group of performers and educators have volunteered their summer months to bring high quality live entertainment and arts education to communities throughout the United States; visiting rural communities, Native American reservations, schools, prisons, youth correctional facilities, assisted living facilities, and hospitals. The organization has brought joy and entertainment to communities throughout California, Oregon, Washington, Idaho, Montana, South Dakota, Alaska and British Columbia, and post-Katrina New Orleans. Proceeds from the performance at the Tower Theatre will help to offset costs of the New Old Time Chautauqua’s 2017 summer tour to rural communities in Central and Eastern Oregon. July 20th at 7:00om at the Madras Performing Arts Center! ● Parade! ​Chautauqua kicks off the week with a celebratory ​parade​ at 1:00 pm on July 16. Led by a 20-piece marching band, jugglers, stilt-walkers, and hula hoopers, the parade will start at Madras Elementary (215 SE 10th Street). Members of the community are welcome to join the parade. Wear a costume or come as you are! ● Workshops!​ Free workshops will take place from 1:30 to 4:30 pm at the Jefferson County Library, (241 SE 7th Street). Workshops are open to all ages and skill levels; participants can attend for all or part. Juggling, Ukulele, Violin, Mime, Earth Geography. Magic, Marimba, Feather Crafting, Song Swap, Qi Gong (a gentle form of Chinese exercise). ● Community Potluck! ​The day wraps up with a community potluck at the Jefferson County Library (241 SE 7th Street). Everyone in town is invited! Bring food, instruments, the kids, and a good joke to tell! ● The Big Show! ​A knock-yer-socks off vaudeville extravaganza will take place at the Madras Performing Arts Center at 7:00 pm on ​Thursday, July 20t​h​. This free event offers an evening of entertainment and delight for the whole family - juggling, acrobatics, dancing, magic, mime, live music, and more - and will feature locally and internationally-acclaimed talent. The Flying Karamazov Brothers​ will wow you with their hilarious juggling and cheap theatrics; magician ​Joey Pipia​’s marvel-packed illusions will leave you astonished; hula hooper extraordinaire ​Vanessa Vortex​ will impress you with her coordination and grace; and Madras’ own ​Sophie Pipia​ (Buff Elementary’s music teacher) will be joined by her sister ​Phina Pipia​, to delight you with their whimsical songs on dueling tubas. 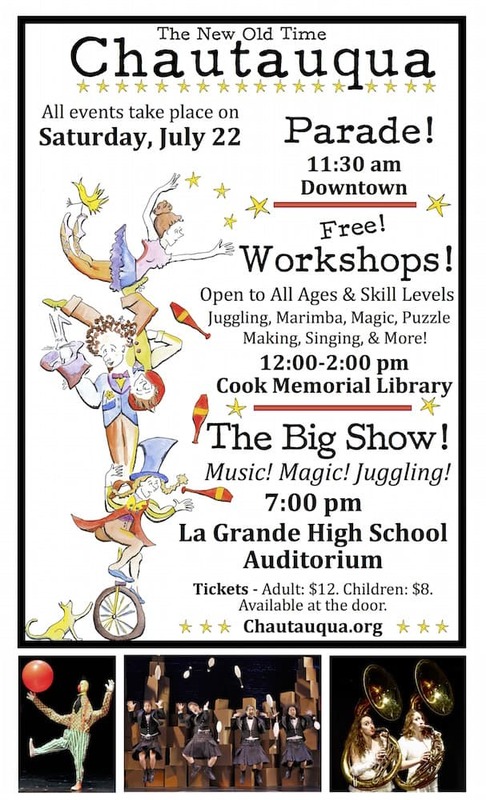 The New Old Time Chautauqua, a nonprofit arts organization, comes to La Grande on July 22nd, offering a live vaudeville show featuring circus arts, music, and magic, free workshops in everything from juggling to singing in rounds, a celebratory parade through town, and more! The New Old Time Chautauqua tours every summer, bringing live performances, community events, and arts education to rural communities across America. This group of volunteer educators, performers, and supporters are committed to keeping the great American legacy of the circuit Chautauquas alive. Parade! Chautauqua kicks off the day with a celebratory parade at 11:30 am starting at the corner of Adams Street and Greenwood Avenue. Led by a 20-piece marching band, jugglers, stilt-walkers, and hula hoopers, the parade will end at the Farmer’s Market, where you can catch a glimpse of the big show to come in the evening. Members of the community are welcome to join the parade. Wear a costume or come as you are! Workshops! Free workshops will take place from 12:00 to 2:00 pm at the Cook Memorial Library (2006 4th Street). Workshops are open to all ages and skill levels; participants can attend for all or part. Make Your Own Tutu, Ayurvedic Medicine (an ancient Indian practice), Earth Geography, Marimba, Facepainting, Juggling. Feather Crafting, Puzzle Making, Singing in Rounds, Magic, Qi Gong (a gentle form of Chinese exercise), Juggling. The Big Show! A knock-yer-socks off vaudeville extravaganza takes place at theL a Grande High School Auditorium at 7:00 pm. This event offers an evening of entertainment and delight for the whole family - juggling, acrobatics, dancing, magic, mime, live music, and more - and will feature locally and internationally-acclaimed talent. This one of a kind vaudeville extravaganza features locally and internationally-acclaimed talent. The Flying Karamazov Brothers will wow you with their hilarious juggling and theatrics; magician Joey Pipia’s marvel-packed illusions will leave you astonished; hula hooper extraordinaire Vanessa Vortex astounds with coordination and grace; and the Pipia Sisters delight with whimsical songs on dueling tubas. Acrobatics and dancing, hat tricks and mime, stilt-walkers and musicians and more - all backed up by the rousing live music and zany wisecracks by the Fighting Instruments of Karma Marching Chamber Band/Orchestra, playing music ranging from marches and sambas to New Orleans Jazz. Tickets are $12 for adults, and $8 for children under 12 and are available at the door beginning on 6:30 pm. In Enterprise, a celebratory parade downtown starts the day on Friday, July 28, followed by workshops from 12:30 to 2:30 on the lawn in front of the Wallowa County Courthouse. In the evening, Chautauqua returns to the OK Theatre for a rollicking night of juggling, music, and vaudeville at 7:00pm. Tickets are available at The Bookloft. Community Potluck! 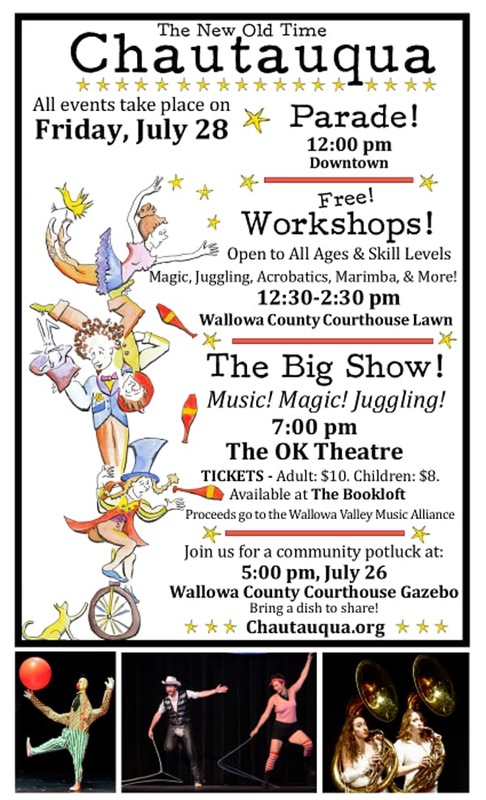 Join Chautauqua for a community potluck at the Wallowa County Courthouse Gazebo at 5:00. Everyone in town is invited! Bring food, instruments, the kids, and a good joke to tell! Parade! Kick off Friday’s events with a celebratory parade at 12:00 pm. Led by a 20-piece marching band, jugglers, stilt-walkers, and hula hoopers, the parade will start at the Enterprise High School parking lot and end at Wallowa County Courthouse. Members of the community are welcome to join the parade. Wear a costume or come as you are! Workshops! Free workshops will take place from 12:30 to 2:30 pm at the gazebo at the Wallowa County Courthouse and at the Enterprise Library across the street. Workshops are open to all ages and skill levels; participants can attend for all or part. Workshops take place at the Wallowa County Courthouse unless otherwise specified. Juggling, Magic, Partner Acro, Marimba, Earth Geography, and Ayurvedic Medicine (an ancient Indian practice)*. Juggling, Puzzle Making, Singing in Rounds, Feather Crafting, Qi Gong (a gentle form of Chinese exercise), and Clowning in Difficult Situations*. *Workshops held at the Enterprise Library. The Big Show! A knock-yer-socks off vaudeville extravaganza takes place at the OK Theatre (208 W. Main Street) for one night only at 7 pm on Friday, July 28th. Tickets are $10 for adults and $8 for children under 12, and are available at the Bookloft, (107 E Main Street) or at the door. Chautauqua last performed in Enterprise in 2012 was sold out, so get your tickets early. Proceeds benefit the Wallowa Valley Music Alliance.